Reach Publishing was incorporated in 1999 and today we are the proud media company that offers readers and our advertisers a diverse platform. From magazines, contract publishing, online news portals and road shows to colleges and universities, we offer a 360 approach in marketing to our clients and allow our readers to read our content in whichever platform they choose, print, online and mobile. Our media titles include include PC.com, Business Today, Travel & Dining, Euro, World Cup, LiveatPC.com, BusinessToday.net.my and specialised contract publishing. With our track record spanning over 18 years, we have made us Tier 1 status media for our amazing award winning work in various industries-Technology, Enterprise, Business and Finance for PR agencies and clients. Our excellent relationship with the private sector, public, NGOs, government agencies and educational institutions, keeps us in constant touch with the market and economy and the same time offer our readers a constructive unbiased view. PC.com and Business Today are No. 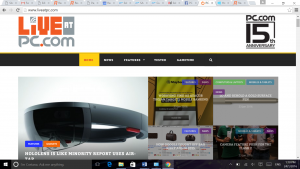 1 magazine in their respective field mainly in Technology and Business. Other SMI & SME events, numerous talk shows and seminars. PC.com has expanded heavily into the digital space, with presences across all major digital media-web and mobile platforms. Our website, www.liveatpc.com serves daily tech news to hundreds of thousands of visitors, and we have over 30,000 Fans and 20,000 Followers on Facebook and Twitter respectively. In the mobile and tablet space, PC.com is available for subscription in Zinio, the world’s largest digital newsstand. In addition, PC.com app can be downloaded on Google Play and Apple store. Business Today, and Travel & Dining each have e-edition on NewsStand in order to reach the more tech-savvy readers of today, and are all available for subscription on Magzter, a leading digital newsstand. Our strong editorial background is further acknowledged with our appointment by MDeC and Sunway Properties, when Reach Publishing was appointed as their official content publisher for their magazines and newsletter.